The Hitchcock Comedy You’ve Never Seen | You gotta get a critic. All right, readers, I’ve finally watched all of Alfred Hitchcock’s American movies. Though I’m surprised it took this long, I never went near 1941’s Mr. and Mrs. Smith until now. Out of 53 full-length movies, this comes in at #26, the end of his first half, in a way. He’d moved from silents to talkies, from England to California, and now (audiences might have guessed) from thrillers to… screwball comedies? Everyone says Mr. and Mrs. Smith is an aberration in Hitch’s filmography. But that’s only a cursory assessment, predicated on the idea that genre is everything. But I think he did understand these people. Hitch loved disrupting the domestic space, and not just with unexplained bird attacks. And his early American output is versatile: Daphne du Maurier’s ghostly romance Rebecca (my thoughts here), then the wrong-man propaganda piece Foreign Correspondent, then goofy Mr. and Mrs. Smith. Where would Hitch go from here? In hindsight, he started to repeat, returning to the English cottage drama of Rebecca with Suspicion, then continuing his wrong-man globe-trotting in Saboteur. But at this point in time, what if he hadn’t? Mr. and Mrs. Smith gives Hitch what he loves best: a witty script and a powerful, sexual leading lady. Carole Lombard could be alluring and angry at the same time. Not hard to see her as the scrappy blonde handcuffed to our Hitchcock hero, or discussing love with Cary Grant on a train. 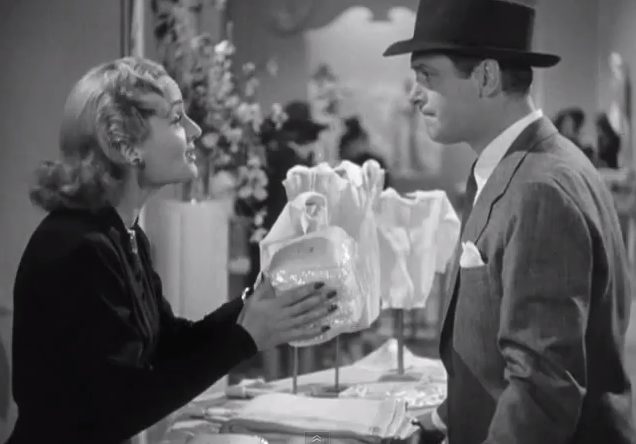 Robert Montgomery isn’t quite up to her level; the whole time, we wait for Lombard to decide when she’s ready for Mr. Smith. We see pieces of Mr. and Mrs. Smith in later movies. The battle of the sexes looms over Rear Window and North by Northwest. In To Catch a Thief, Hitch seems to enjoy the repartee more than the burglary. A screwball sensibility informs Shirley Maclaine in The Trouble with Harry, Barbara Harris in Family Plot… and even Robert Walker in Strangers on a Train! From here on, Hitch was more firmly in control of the projects he directed, but there’s something about this mid-career one-off that, funny enough, doesn’t feel so out of place.